ItemBARK_1990.0003.1058 - The Hoy family, back row, left to right: Lona, Yvonne, May, Avaline, Henry Sing (Avaline's husband), Anne, Rose, Star and Lily. Front row, left to right: Mooney, Benny, Mrs. Lim Foon Hai Hoy, Irene, Mr. Chow Dong Hoy and Jack; circa 1939. Item BARK_1990.0003.1058 - The Hoy family, back row, left to right: Lona, Yvonne, May, Avaline, Henry Sing (Avaline's husband), Anne, Rose, Star and Lily. 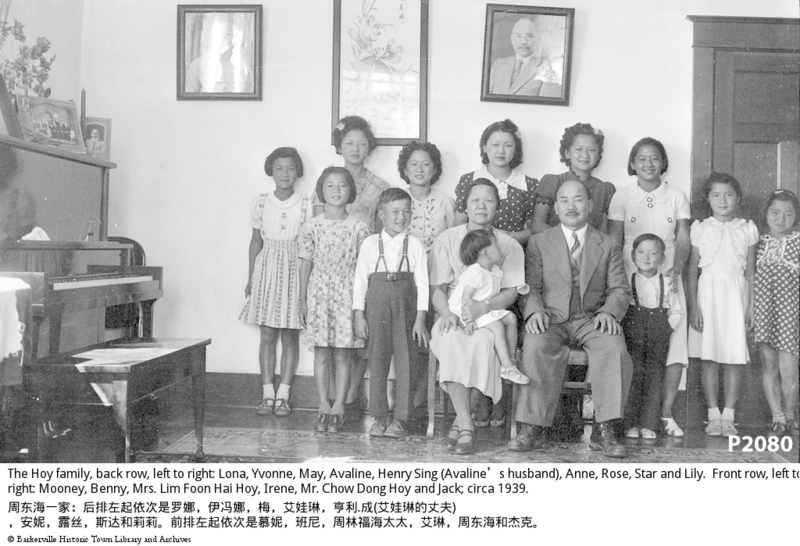 Front row, left to right: Mooney, Benny, Mrs. Lim Foon Hai Hoy, Irene, Mr. Chow Dong Hoy and Jack; circa 1939.